Stems prostrate to ascending, spreading, 3-40 cm. Leaf blades linear to oblanceolate, 1-10 cm, glabrous or with elongate, 1-cellular hairs. Flowers: sepals 2.5-8 mm; petals 4-15 mm; stamens 3-15; pedicel ± straight in fruit, 0.4-2.5 cm. Capsules usually not exceeding calyx by 3+ mm. Seeds 10-20, 1-2.5 mm wide, finely reticulate at 30×. 2n = 24. Flowering spring. 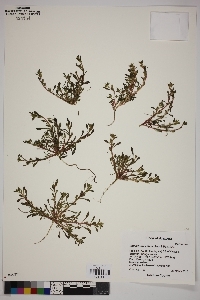 Sandy to loamy soils, grassy areas, cultivated fields; 10-1900 m; B.C. ; Ariz., Calif., N.Mex., Oreg., Wash.; w Mexico; Central America (Guatemala); nw South America. Calandrina ciliata is highly variable vegetatively, especially in size, but is uniform in flower, fruit, and seed. 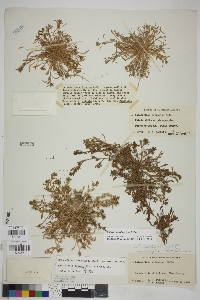 It is very similar to C. breweri (see discussion above). Herbs to 30 cm tall, from slender to thick taproot. STEMS spreading, prostrate to ascending. LEAVES: linear to oblanceolate, to 10 cm long, glabrous or ciliate. FLOWERS: 2-15; pedicels 4-13 mm long; sepals 2.5 - 8 mm long; petals 4-11 mm long, red to purple. SEEDS: 5-20, elliptic, finely reticulate, 1-2.5 mm long. —Sandy to loamy soil, sand and gravel washes, rocky slopes. Cochise, Gila, Graham, Maricopa, Mohave, Pima, Pinal, Santa Cruz, Yavapai cos.; 425-1550 m (1400 - 5100 ft); Feb-Jun; CA, OR, WA; w Mex., Guatemala, w S. Amer. References: Allison Bair, Marissa Howe, Daniela Roth, Robin Taylor and Tina Ayers. 2006. Vascular Plants of Arizona: Portulacaceae. CANOTIA 2(1): 1-22.